Day 15 – Halfway there? So we’re at day 15. How am I looking? Let’s ask the trusty stats page! See the difference? Back in June, I was always above average after Day 1. Not so much the case this month. Part of the reason has just been this month in general. The month started off with the most brutal few days of work I have ever had. Then the next weekend, a friend of mine gets alcohol poisoning (she’s fine though. It didn’t help she was 1/3 my size!). This weekend I already have plans and next week is Thanksgiving. I am also just getting tired of Perverse Selection. It’s in a state where there’s a big picture, but not everything is connecting. I’m losing the will to even think about the story, the characters, etc. The end is there, I just don’t know how to get to it. Do I want to finish it? Of course! But I think I’m just so use to the project, I am craving another story. I can’t tell you how much I miss world building. So I think after this month, I’m going to give the story a rest. It’s not going in the trash. I just think I need a change of scenery you know? Here’s to finishing NaNoWriMo strong! Don’t let me keep you guys down! Day Fifteen – Where do we stand? 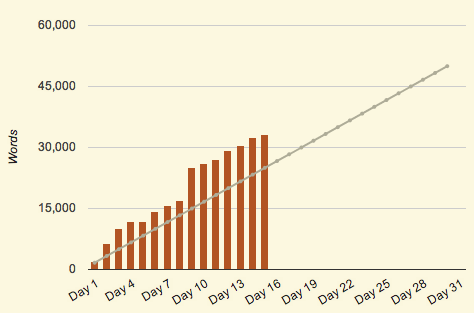 So we’ve hit the halfway point of Camp NaNoWriMo. Lots of hot dogs and marshmellows cooked at the camp fire. Trails traversed. Rocks climbed over. Anyway, how am I looking so far? I wish my savings account grew this fast. Day 9 was a big help for me. It allowed me to always stay above the minimum words needed for each day. While the graph continues to grow, it has slowed down recently. Work can do this to you. What to expect? Well I’m hitting a crucial midway point. The antagonist’s grip on the protagonists is tightening. It’s only going to get worst for my heroes for a while. Can they overcome this growing conflict? Sidewinder and Kait need to work together. As you’ve probably read the character profiles for Sidewinder and Kait, you can see how they may work together. Sidewinder represents the bold, but reckless partner who lets his fists do the talking (though he does have a big mouth). He’ll jump in and give anyone a hard time right off the bat…though sometimes he really should think before he acts. Kait represents the level-headed, but overly-cautious partner. She’ll analyze the situation and figure out the best way to win. She’ll sit back and wait for the opportune moment. Sometimes that moment will never come. Both methods can work at the right time. They just have to figure out when.